All I want for Christmas is a good night’s sleep – and perhaps a nap or two…sigh. 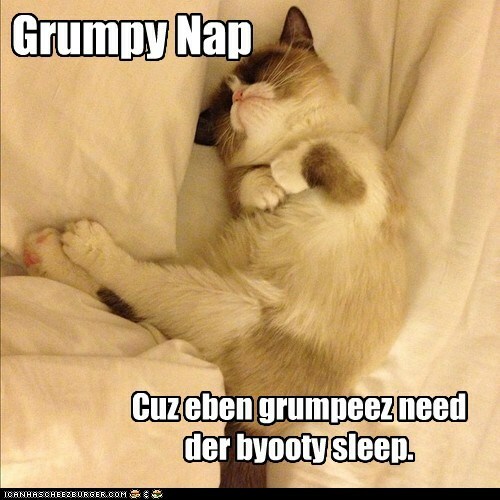 Categories: Blogroll, Cats, Uncategorized | Tags: 2012, attitude, Children, GrumpyCat, sleep | Permalink. I’m off to read soon. Seems the cold I’ve had for a while now (thanks to school starting and weather changing) is getting worse, not better. Well, at the least, it is lingering. I have no doubt that recent stresses and losses and tough choices have played a part in it; I just wonder if it will clear up now. Sigh. Sick and tired – of being sick, and tired. On the bright side, this weekend I will be spending time with two wonderful “girl” friends – and relaxing and enjoying wine in the sun! That should fix me right up! That’s right, there is a wine festival and town and the girls are having girls’ day/night out! Yay! Categories: Health, Miscellaneous | Tags: 2012, attitude, girls day, sleep, stress, wine festival | Permalink. So I am trying to work on all of those things, plus being good to myself overall and not stressing or worrying about the little things. I’m journaling more now, not pressuring myself about the housework, and reading a little. I’ve started crocheting again – and have started a new project which has helped keep me motivated. I have taken the new prescription two nights now and I used the sleep aid one night, and I feel more like myself than I have in a long time. The motivation to get things done is coming back. I feel less apathetic – I didn’t really realize how bad that had gotten until I started feeling better – that’s kind of scary really. Here is to better days, and feeling better. Categories: Blogroll, Depression, Encouragement, Health | Tags: Depression, Health, Personal, self-care, sleep | Permalink.